Second only to my love of Mediterranean flavors comes my love of Mexican flavors. Many years ago I made tacos by browning ground beef, ripping open a yellow packet of Old El Paso taco seasoning and melting shredded Kraft Mexican blend cheese on a tortilla. 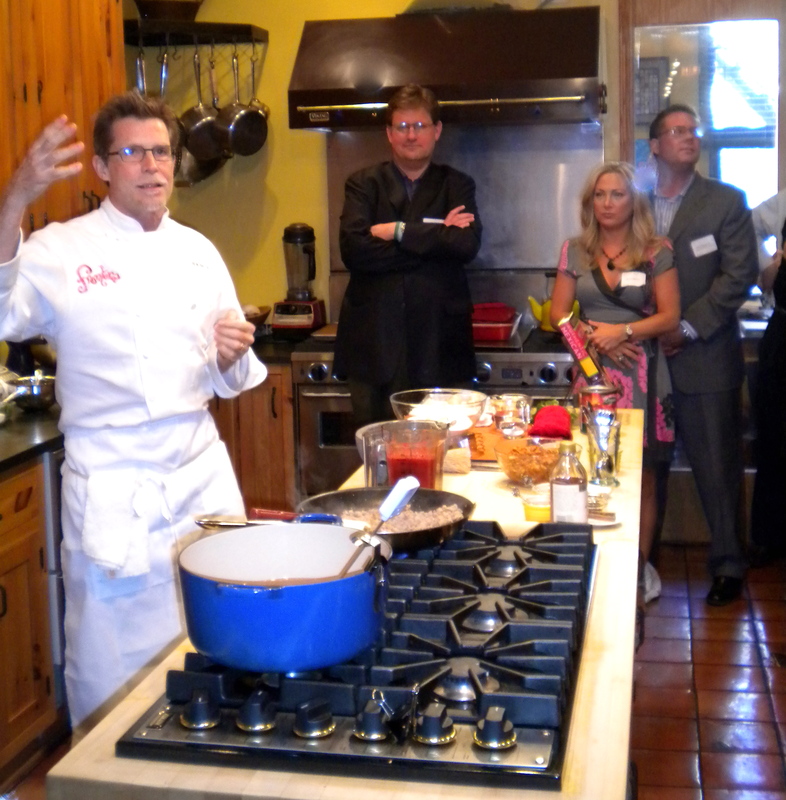 Luckily our very own Chicago chef Rick Bayless has written many cookbooks and opened my eyes to the world of exquisite Mexican cooking using fresh, authentic ingredients and flavors. He has three restaurants in Chicago: Frontera Grill, Topolobambo and the new XOCO exploring Mexican cuisine. Last spring we were lucky enough to attend a corporate event in the development kitchen above Frontera Grill. Those are my friends Pete, Kerri and Tom listening to Rick Bayless explain how to make empanadas. Rick Bayless also offers a wonderful line of grocery products under the Frontera moniker. It can be found in the Mexican food aisle at the grocery store. Rick Bayless’ website says this about his restaurants “If Topolobambo pampers and Frontera dances, then XOCO rocks. Though the word XOCO is Mexican slang for “little sister” there’s nothing little about XOCO’s big, bold Mexican marketplace flavors and contemporary expressions of Mexico’s most beloved street food and snacks “ Today in the spirit of XOCO I bring you a pulled chili pork street taco – using Frontera gourmet tomatillo salsa of course! The pulled pork does not need a lot of prep time but it does cook for 3-4 hours. I usually make the pork ahead of time and then it’s easy to assemble the condiments later to make for a quick and tasty taco. The first important step is to sear the meat. This caramelizes the outside and infuses lots of flavor into the dish. Heat a large heavy bottom skillet over medium high heat. Add a touch of oil. Working in batches add a few pieces of pork to the pan. Don't overcrowd the meat or it will steam instead of sear and won't develop the outside crust. 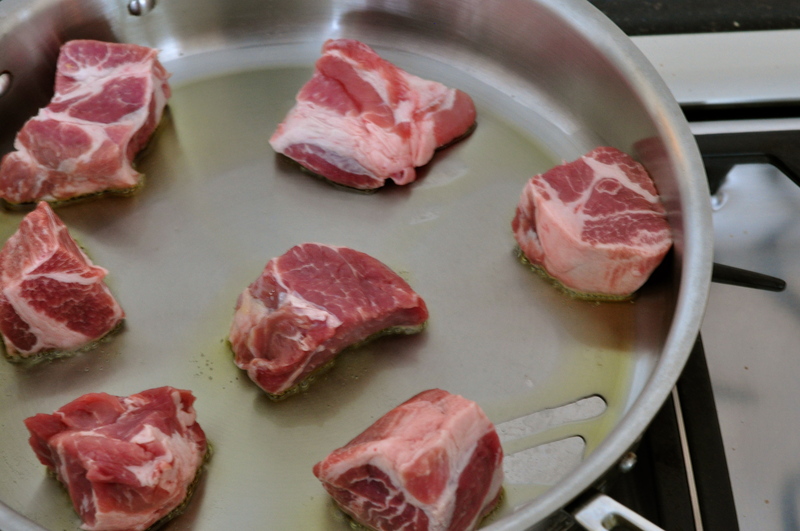 At first the pan will "grab" the meat and it will stick to the pan. Don't worry, the pan will "release" the meat once a beautiful caramelized crust is formed. 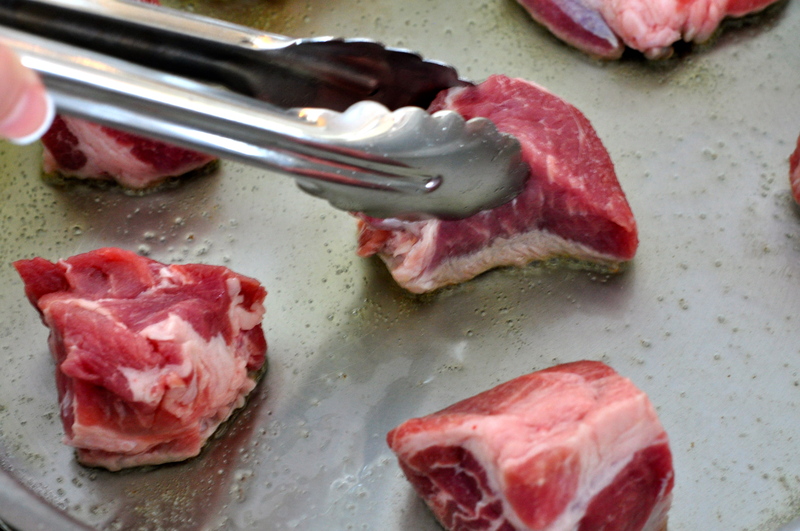 The meat effortlessly pulls away from the pan once the crust is developed. Turn pieces over with tongs and repeat the process on the other side. Once completed, transfer to a holding plate and start the next batch. Take the pan off the heat. We don't want to lose all that good flavor still in the pan so we will deglaze the pan with our braising liquid. To make the braising liquid combine the apple cider vinegar, lime juice, cumin, oregano, cloves, salt, pepper and chicken stock. Pour into pan to and stir to loosen the drippings. Swirl it around until the bottom of the pan is clean and add the chopped chipotle pepper(s) The chipotle peppers are very hot! Use only one or two depending on how much heat you want. Put the seared meat in a crockpot. Pour the braising liquid over the meat. Add the bay leaves and crushed garlic. Put the lid on, turn the heat on low and cook for 3-4 hours. If you don't have a crock pot you can put the meat in a dutch oven, cover it and cook in the oven at 300 degrees for 3-4 hours. It is really important that the meat cooks gently for a long time. If you look in the crockpot and it is fiercely boiling turn the heat down or lift the lid to release some heat. 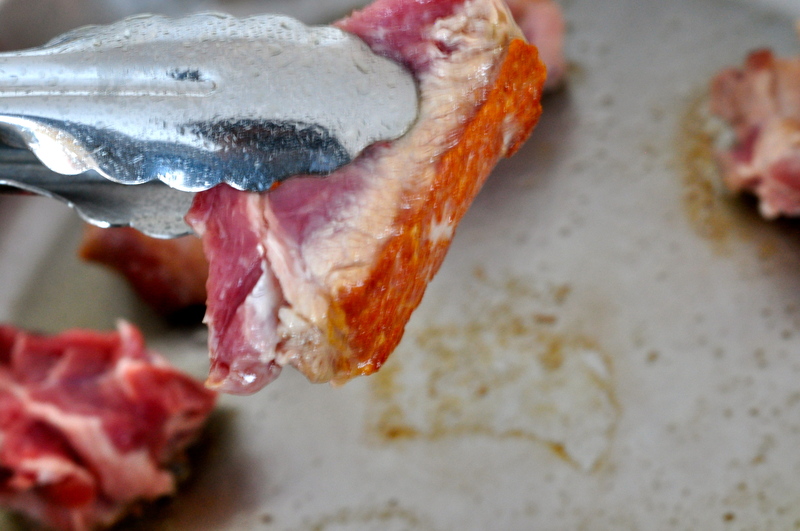 When it is finished cooking the meat will literally fall apart when pulled with a fork. If you have time I always let the meat sit in the braising liquid for about another hour off the heat once it is done cooking. 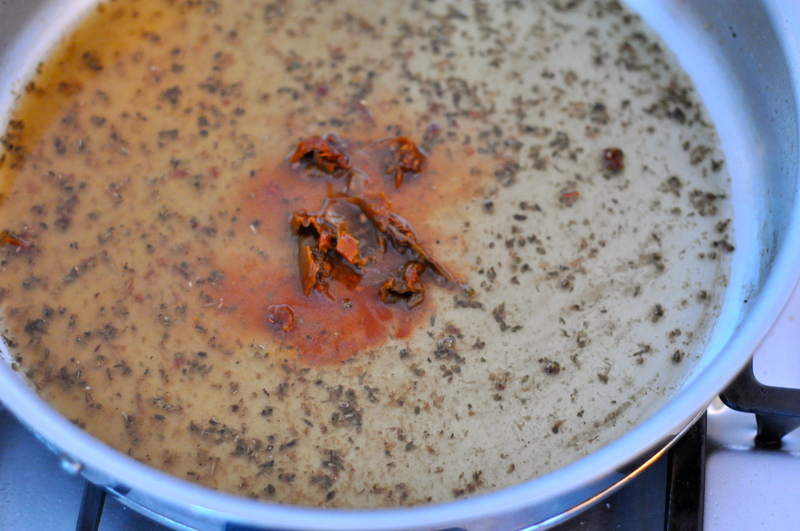 This allows the meat to rest and infuses the meat with the braising liquid making it extra tender and juicy. 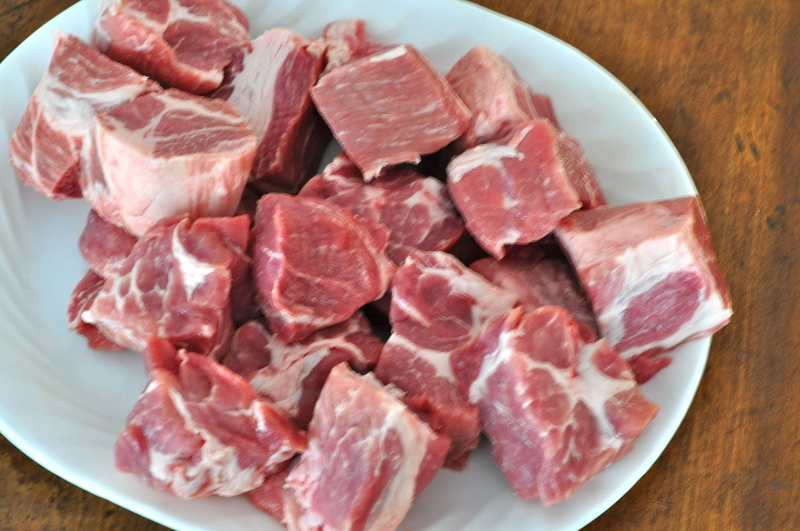 Remove the chunks of meat from the liquid and pull apart by shredding it with a fork. Discard any fatty parts once the meat is pulled. 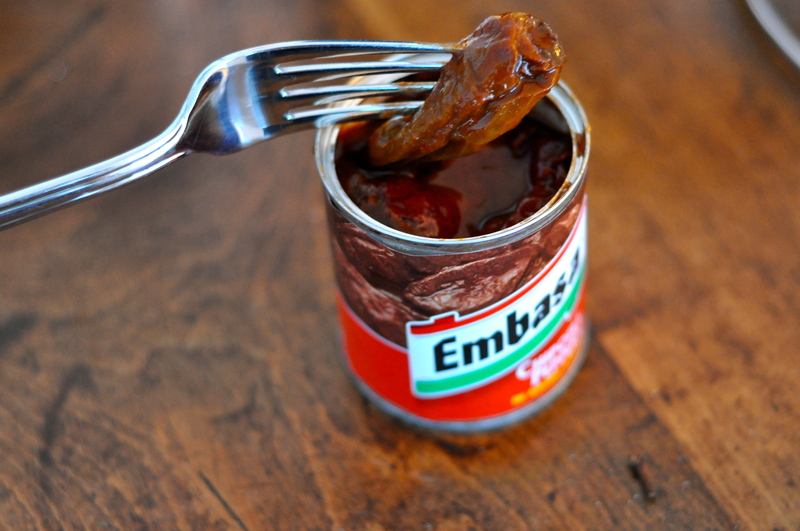 You can use a little of the braising liquid to moisten the meat but then discard the rest. The meat is now done and can be used right away or stored and reheated when you are ready for the tacos. These are the condiments I use for the tacos. 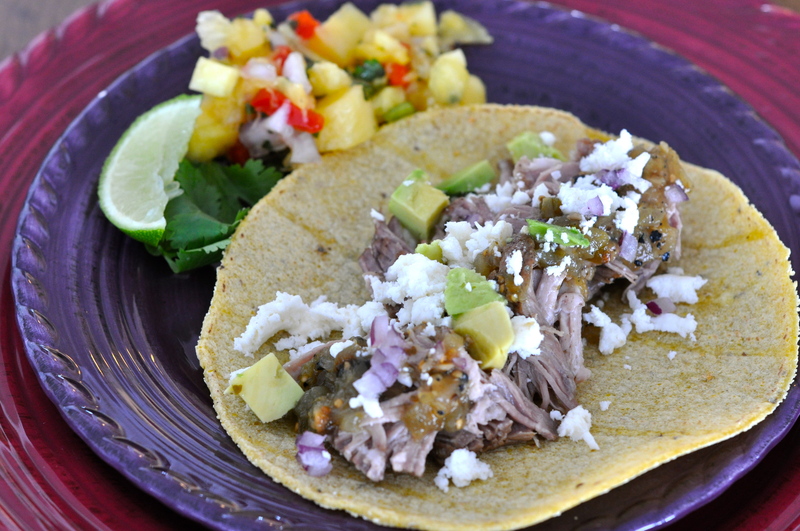 The Frontera tomatillo salsa is perfect for the pulled chili pork because it is strong and acidic and compliments the flavor. The same for the pineapple salsa. I don't like using red tomato based salsas for this taco because I feel it muddies the fresh flavor of the pulled pork. The first important step is to sear the meat. This caramelizes the outside and infuses lots of flavor into the dish. Heat a large heavy bottom skillet over medium high heat. Add a touch of oil. Working in batches add a few pieces of pork to the pan. Don’t overcrowd the meat or it will steam instead of sear and won’t develop the outside crust. At first the pan will “grab” the meat. In this picture I am actually pulling as hard as I can on the meat and it is stuck to the pan. Don’t worry the pan will “release” the meat once a beautiful caramelized crust is formed. As promised the meat effortlessly pulls away from the pan once the crust is developed. Turn pieces over with tongs and repeat the process on the other side. Once completed transfer to a holding plate and start the next batch. 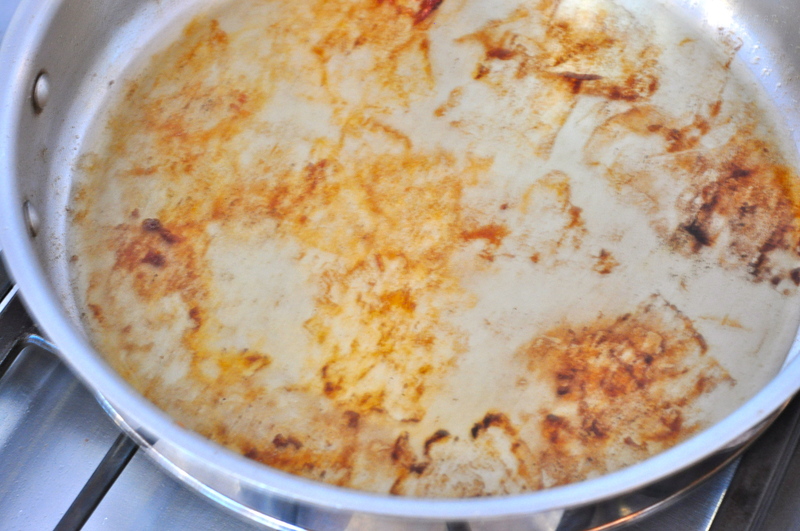 Once completed the pan will look like this. Take the pan off the heat. We don’t want to lose all that good flavor still in the pan so we will deglaze the pan with our braising liquid. 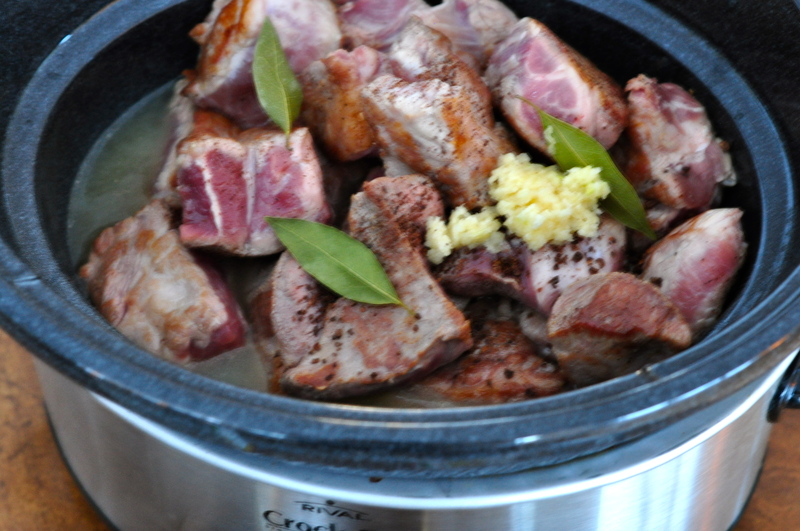 Put the seared meat in a crockpot. Pour the braising liquid over the meat. Add the bay leaves and crushed garlic. Put the lid on, turn the heat on low and cook for 3-4 hours. If you don’t have a crock pot you can put the meat in a dutch oven, cover it and cook in the oven at 300 degrees for 3-4 hours. It is really important that the meat cooks gently for a long time. If you look in the crockpot and it is fiercely boiling turn the heat down or lift the lid to release some heat. 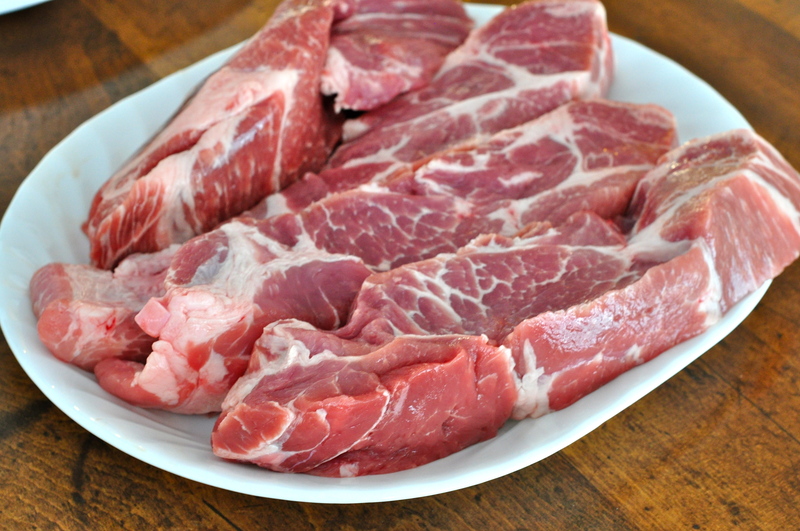 When it is finished cooking the meat will literally fall apart when pulled with a fork. If you have time I always let the meat sit in the braising liquid for about another hour off the heat once it is done cooking. 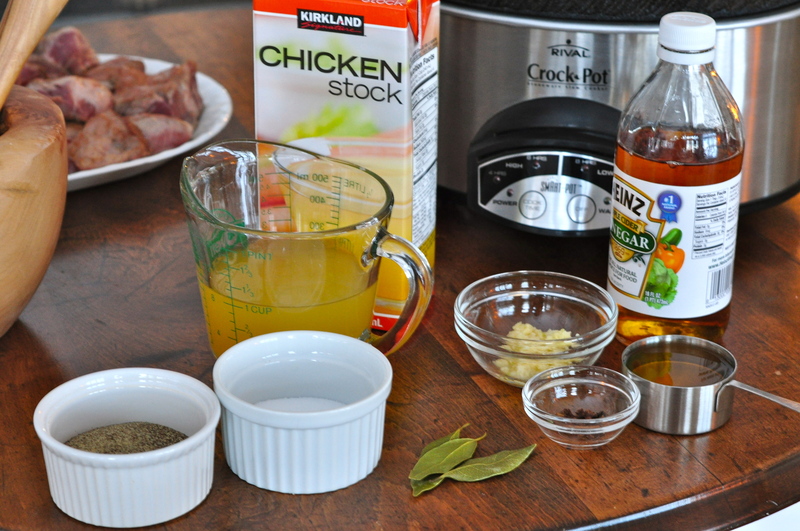 This allows the meat to rest and infuses the meat with the braising liquid making it extra tender and juicy. 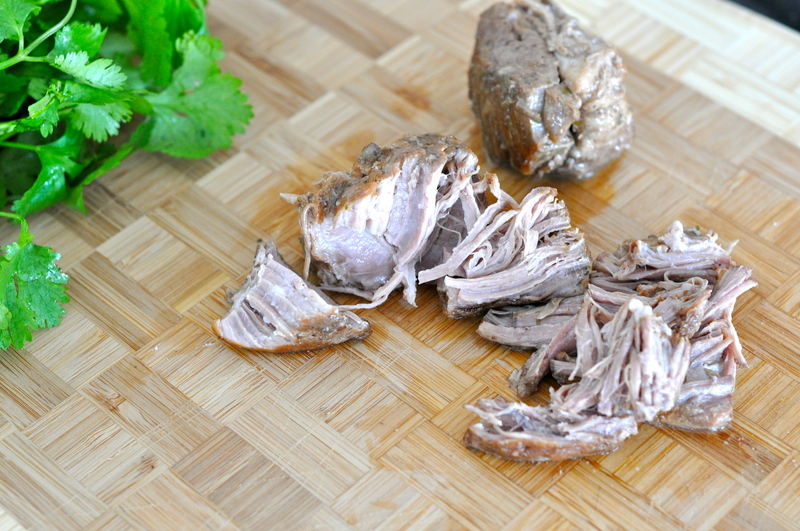 Remove the chunks of meat from the liquid and pull apart by shredding it with a fork. Discard any fatty parts once the meat is pulled. You can use a little of the braising liquid to moisten the meat but then discard the rest. The meat is now done and can be used right away or stored and reheated when you are ready for the tacos. These are the condiments I use for the tacos. 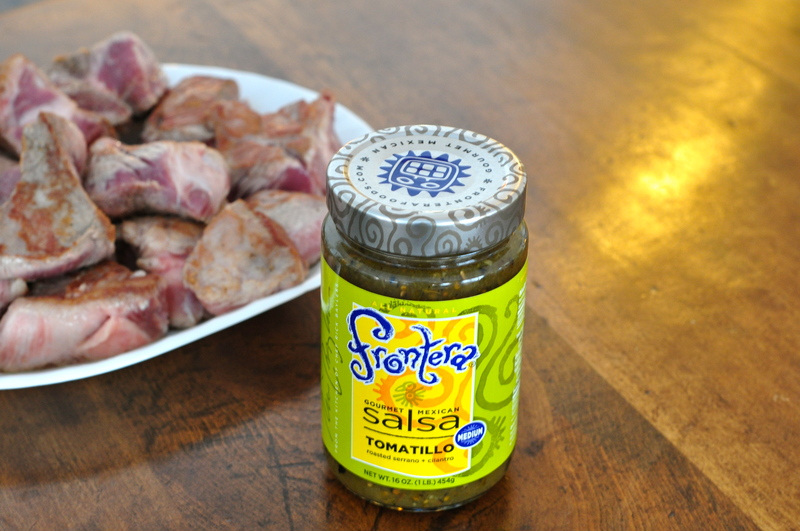 The Frontera tomatillo salsa is perfect for the pulled chili pork because it is strong and acidic and compliments the flavor. 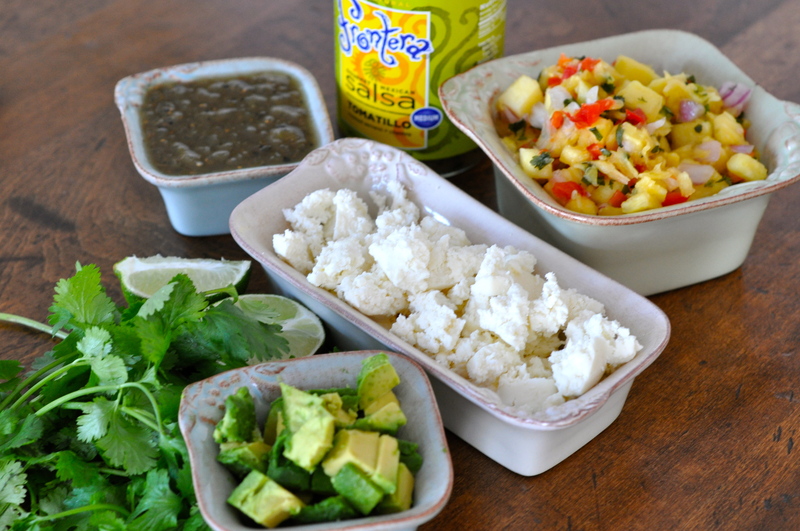 The same for the pineapple salsa. I don’t like using red tomato based salsas for this taco because I feel it muddies the fresh flavor of the pulled pork. This makes my mouth water! Enjoy!! I SO LOVE Rick Bayless…and YOU, lady, are KILLING me with these recipes and photos. I demand that you include virtual tastes with each post. It’s the humane thing to do. Cathy. 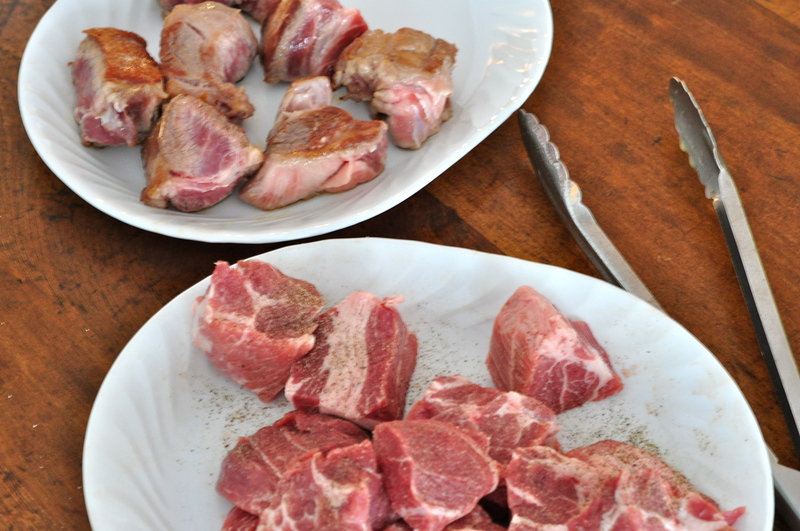 Question about searing the pork… I shouldn’t stir the pork around while it is searing? Should it cook in one place until the crust is formed? Also I should sear all sides of each piece right? Finally can we ise a fresg pepper raher than canned? We dont use a lot od hot spices so woyld only biy as much as we need. What do yoi suggest? Thanks! Will be trying this soon!